Provide support and encouragement for the athletic, academic and personal achievements of the Mesquite High School Wildcats Football Program, by volunteering time, contributing financial resources, and fundraising for the success of the team. Find news, information, schedules, rosters, game results, directions and much more. Check back frequently for the latest information about the MHS Football Program and the MHS Touchdown Club. Easy Ways to Support MHS Touchdown Club!! See the programs below for details on easy ways you can help support the MHS Touchdown Club!! Did you know you can support the MHS Touchdown Club just by shopping at Fry's? It's easy when you enroll in Fry's Community Rewards! Once you're enrolled, you'll earn rewards for our program every time you shop and use your V.I.P Card! It’s that easy!! If you have a Fry's V.I.P account, click here to enroll/re-enroll in the Fry's Community Rewards program. Log in and search Mesquite High School Touchdown Club. If you do not have a Fry’s V.I.P online account, click here to create one. Then search for Mesquite High School Touchdown Club. AmazonSmile is a simple and automatic way for you to support MHS Touchdown Club every time you shop, at no cost to you. When you shop at smile.amazon.com, you’ll find the exact same low prices, vast selection and convenient shopping experience as Amazon.com, with the added bonus that Amazon will donate 0.5% of the purchase price to MHS Touchdown Club! On your first visit to AmazonSmile (smile.amazon.com), you need to search 'Mesquite High School Football Touchdown Club' to receive donations from eligible purchases before you begin shopping. Amazon will remember your selection, and then every eligible purchase you make at smile.amazon.com will result in a donation. Get involved and help support our Wildcat Program! We need you!!! 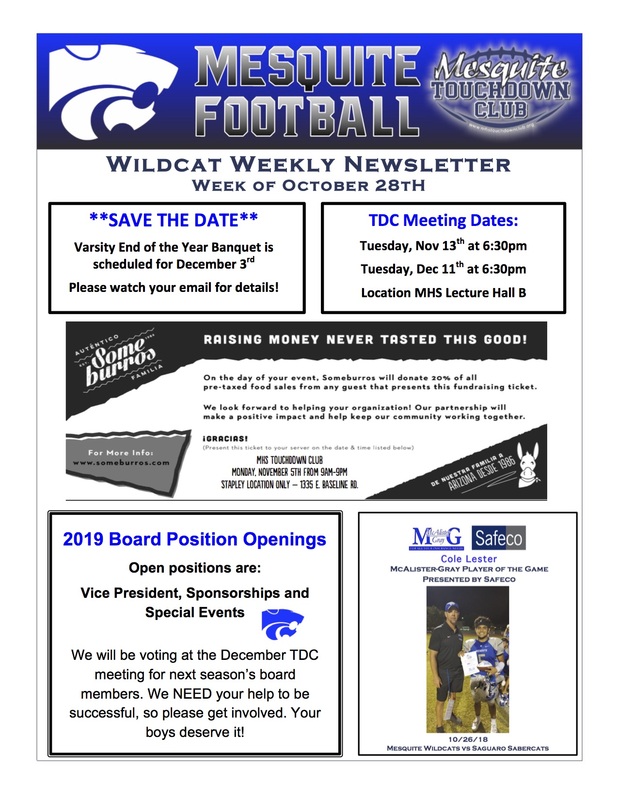 Stay up to date by clicking on the logo below for this week's Wildcat Newsletter!! Find prior Wildcat Newsletters here.